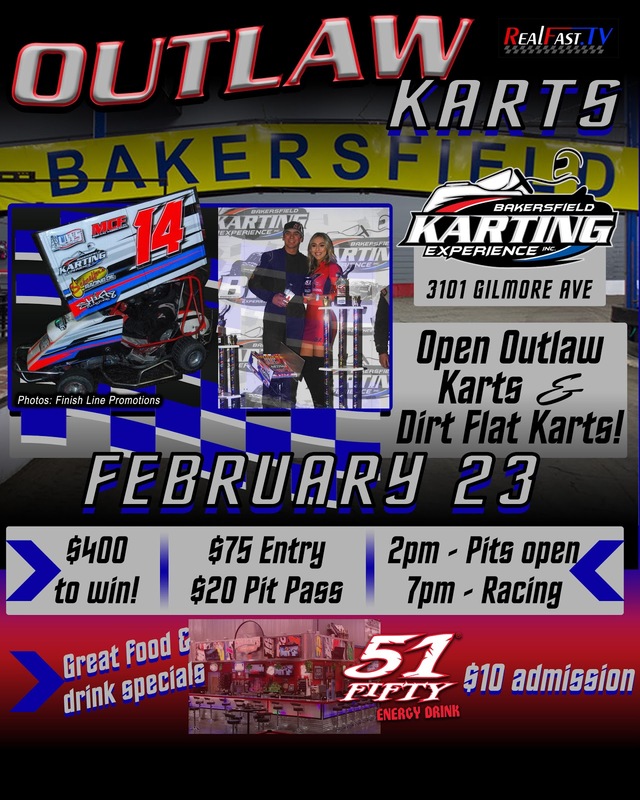 BAKERSFIELD, CALIFORNIA (February 14, 2018) – Friday’s scheduled round #5 of Open Outlaw Karts at Bakersfield Karting Experience has been postponed to Friday February 23rd after a scheduling conflict. The 1/10th mile dirt oval will be very busy on the 23rd as the Open Outlaw Karts will join the already scheduled Stock and Open dirt flat karts for a three division show. 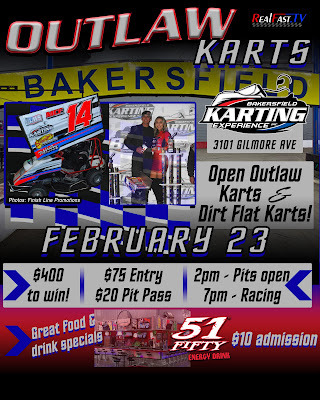 The last time karts and Outlaw Karts raced on the same program was on January 20th during the Bakersfield Indoor Kart Nationals, where Mitch Cornelius won the $200 Clone kart main event and Tate Sanders won the $1000 Open Outlaw nationals. Next Friday’s 25-lap feature for the Open Outlaws will pay $400 to win out of a $1000 purse for a series that has averaged 20 entries in its inaugural season. Bakersfield Pro Stock champion Tim Randolph won the series debut in December before IMCA Modified standout Ethan Dotson claimed round two. Bakersfield Speedway Modified champion Brad Pounds and Sanders are the other two main event winners this year. Pounds currently enjoys a 22 point advantage in the standings. With all four races swept by Bakersfield drivers and no repeat winners so far, the competition level will be intense heading into round five. Drivers such Larry Moody and Bryan Watson – 2nd and 3rd in points respectively – will be looking to get their shot on top of the podium on Friday. General admission tickets will be $10 next Friday night with live music adding to the festivities. Pit gates open at 2 p.m. with drivers meeting at 6:30 p.m. and racing at 7 p.m. Pit passes are $20. The state of the art facility is Bakersfield’s newest complete entertainment venue, with RC car racing, oval dirt kart racing, golf simulator, arcade games, and food and drink specials. BKE is open to the public 7 days a week with karts available for rent for a single race or for group outings. Birthday parties and private room rentals round out the extensive options for a night out or for a great get together.